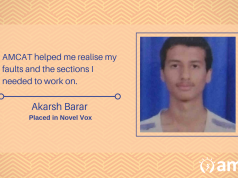 Keep reading to know how Bushra Khan scored an easy way out to land up on a job with Magic Pin. 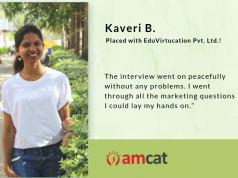 The Success Courtesy: the AMCAT test, says the Engineering Graduate. Bushra Khan, an Engineering Graduate, Shree Institute of Technology (Class of 2016) shares her experience in working with Magic Pin and tells us how the AMCAT test helped her scouting that job. Bushra loves photography and reading. This engineering graduate also enjoys driving, listening to music. Let us read what Bushra has to narrate. I prepared from the online sample papers and from aptitude books. Q. While looking for a job, did you face any difficulties? If yes, which ones. And why did you opt for the AMCAT test? Bushra scored a job with Magic Pin, working as an Associate in Merchant Support. 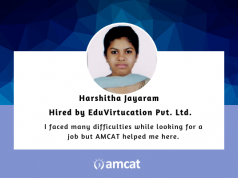 She says she found the AMCAT test to be of utmost help in getting the job. She feels she took the right decision to take the test as she was looking for a job. Q. How was the AMCAT test experience? Q. When did you get your first interview call? How many did you receive? For this Graduate, getting interview calls was not a bump in the road. Bushra proudly tells us the plenty of interview calls she got in a short duration of time! Q. How was the interview process at the company? What helped you through it? Q. Would you recommend the AMCAT to others? If yes, Why? Q. In the end, do you have any tips that can help other job seekers in getting a good job? I got my interview call within 15 days, says the candidate with a job in Uber. Just a 22-year-old dysfunctional Coffee person who loves Margherita Pizza 6 times a week. I love bright lights, NH-8, cityscapes (I <3 New York), places crowded with good people. Always fascinated with talks and Human Brain. Also, I am a Jackson fan. Thoughts drive me. What about you? This completely depends on the topics you’re updated with, and the profile you are planning to take up in your first job. You can check the syllabus of both these options here and decide accordingly. Meanwhile, one of our advisers will get in touch with you to give you better clarity on this.